SonicMaps is a new Locative Audio (GPS AudioTour) platform that’s designed to be a complete solution for sound geolocation. 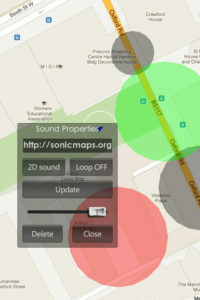 With SonicMaps, you can create an audio guide to a popular place, a located music composition/playlist, audio games (e.g. Treasure Hunt), located poetry, or simply send geolocated audio messages to your friends. Using the 3D audio engine option, sounds can be fixed to real world positions, so they are consistently perceived into space while rotating your device (panning) and levels are attenuated according to distance (intensity). Upload your audio files to your favourite hosting service. Go to the desired location and start placing sounds around using the SonicMaps Editor iOS application. Then, you can publish and share your project with other users who will be able to experience your composition as they walk on the selected location. SonicMaps uses “on-site” editing, avoiding common inaccuracy problems in similar web-based services due to high buildings, maps displacements, etc. Requires iOS 4.3 or later. Audio files links must point to the actual file name which should be in the mp3 format (e.g. http://sonicmaps.org/sample.mp3). Short or encoded links are currently not supported. SonicMaps is $2.99 in the App Store. I got SonicMaps for my new iPhone and sound playback is absolutely smooth and precise. Great tool for creative people who love playing with sound (like me!) or just want to make an audio guide to a place.